But for many include paths, this is a time-consuming process. But there is another way. Then press the host operating system shortcut for copy (CTRL-C on Windows), go to your destination panel and use the paste (CTRL-V on Windows) shortcut, and all the paths get copied. This approach works for all ‘list’ setting items, e.g. linker library settings. 💡 Unfortunately Eclipse does not show a context menu for the copy/paste operation in the settings panel. But you can use copy-paste for pretty much every setting, as long as you copy normal text. That way I can use a script or anything I want to create that list of items, then copy-paste it into the settings. Copy-Paste is a fast way to apply large sets of path (or list of items). That way I can easily copy settings from an existing project. Or I can create a list of folders in text file and then apply them all in one step. That way I can easily assign multiple items in a single step. This entry was posted in CodeWarrior, Eclipse, Tips & Tricks and tagged arm gcc, Building, CodeWarrior, Eclipse, gnu gcc, technology, Tips&Tricks, tool chains by Erich Styger. Bookmark the permalink. Interesting. Just tried this for KDS3.01/win8.1 and didn’t work for me. Had to add lines one by one. Even tried copying into notepad, then copying into add include path. Strange. It works for me that way in Win7. I have not tried it on Win8 yet, but I would not have thought that this would be different? Hi Erich. I’m having troubles trying to add a folder to the compiler path. 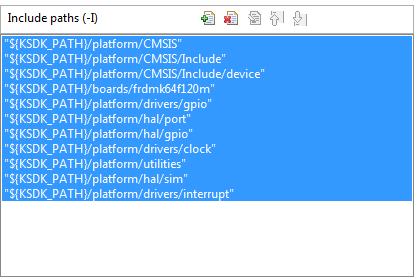 I’m using Kinetis Design Studio and I have created some drivers to use the gpio, tpm, etc. 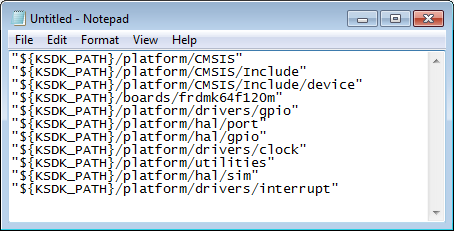 of a Kinetis device.This are .c and .h files, inside a folder with the name “drivers”. The problem is that if I follow your post, it appears that KDS is finding only my .h files, but not the.c files. I’m wondering if you know how I can solve this. I just want to create a folder with peripherals drivers and use it with all my projects. usually it is the other way around: the compiler finds the source (.c) files, but not the header (.h) files. The path to the .c files is passed to the compiler when compiling that file. 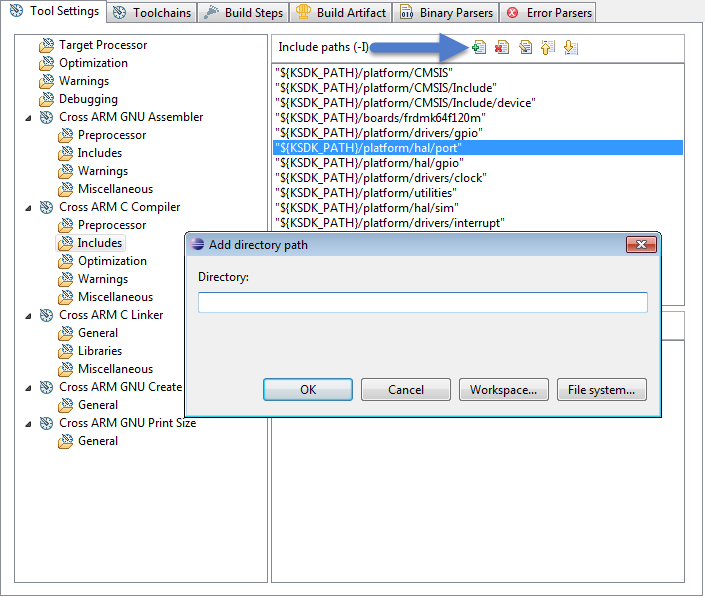 But the paths to the header files is passed with the -I (include header search path/folder). So are you sure it does not find the .c files (and it is not about the .h files)? Can you post and details (e.g. the console log)? And if I click on them holding the ctrl key, it takes me to those files, so I assume that KDS is finding the .h files, but not the .c files. But maybe I’m wrong. You need to add all the necessary sources files, e.g. where CLK_init(), GPIO_Init() etc are in to your project. The compiler has no way to magically find the .c source files for it.